Wale Gates has trolled Deeper Life Church new auditorium after they unveiled their new Church auditorium with Vice President Yemi Osinbajopresent. Speaking about the new building, the general superintendent, Pastor W.F Kumuyi said the idea was to give God a befitting worship center. “The project is not, in any way, an advertisement of self or riches. It is served to accelerate the earnest fulfilment of the Great Commission. There are no riches to advertise anyway because the resources came from all strata of membership of the church. Everyone contributed his or her mite. It was a determination to give God the very best”, he said. 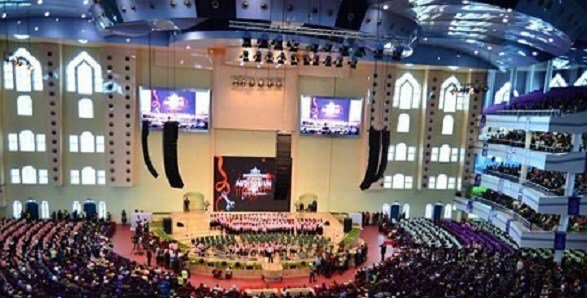 However, Wale Gates wondered why the newly unveiled auditorium has two large screen monitors after so many years of the Church having a strong stance against members having television in their homes. 0 Response to "Wale Gates trolls newly unveiled Deeper Life Bible Church auditorium"